Costs of living can vary dramatically from place to place thanks to factors like local taxes and regional employment figures. For travellers and businesses alike, knowing where you will get more bang for your buck is crucial if you want to make your yen, yuan, krona or euro stretch as far as possible. 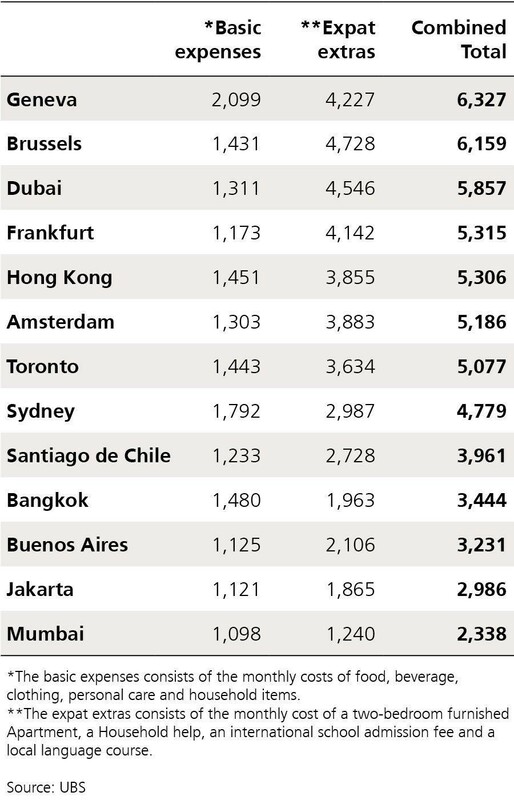 To this end, a survey of the most expensive cities from Swiss bank UBS may prove a handy tool. Between January and April, UBS gathered more than 75,000 data points on prices and earnings from 77 cities worldwide. By using a complicated formula, the study provides a breakdown of how much it would cost for a European family of three to visit or live in rental accommodation in cities around the world. The chart above, for example, gives a points-based ranking of the most expensive cities in the world. It uses New York as its base reference. But, somewhat counterintuitively as UBS’s authors admit, housing costs in the US city are so high that cities “lose price-index points” if they cost less to live in. So it may seem to anyone who does not know this that the costs of living in some places appears to go down once rent is stripped out of the equation. For the patient, drilling down into UBS’ data provides some revealing insights. One chart compares monthly living costs for a European family in 13 cities, including food, household goods, clothing and local “expat extras”, such as renting a two-bedroom furnished apartment, international school tuition fees for the children, household help twice a month and a language course. The cost of family living compared across 13 cities. Intriguing titbits include the fact that accommodation in Frankfurt, fourth of the 13, is lower than in the top three, but international school fees can reach $1,756.71 a month, while accommodation in fifth-placed Honk Kong is higher than in any other city on the list. 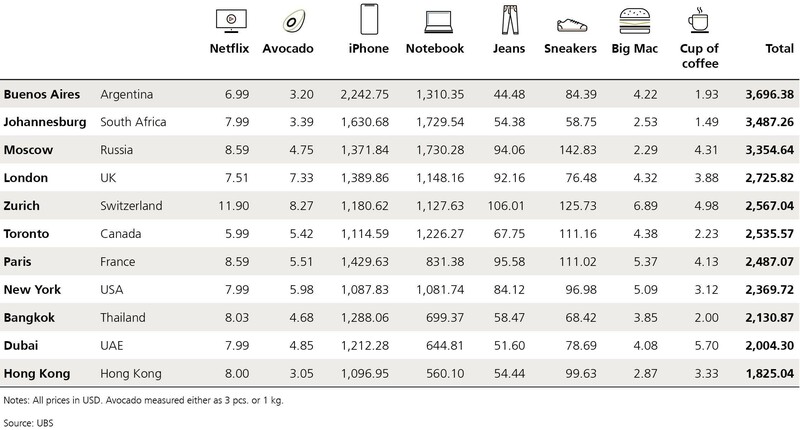 Another chart examines the costs of millennial-generation essentials, ranging from the latest iPhones to avocados. 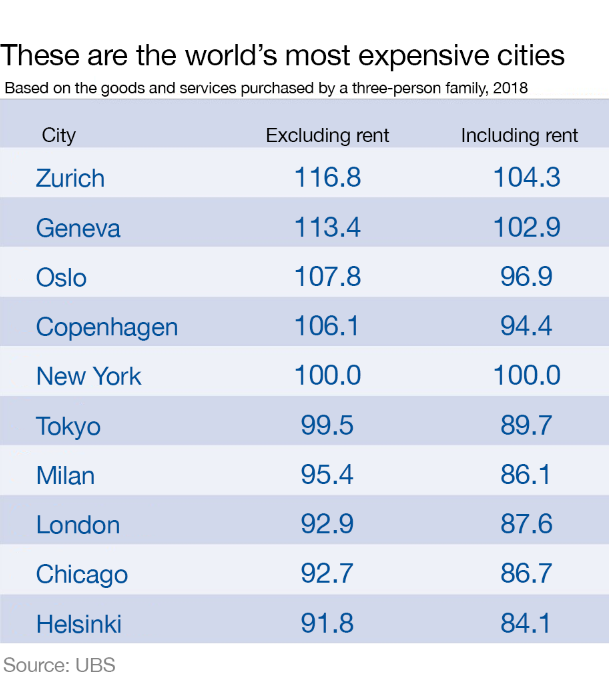 This finds that, while Buenos Aires is one of the cheapest of the 13 cities for families to live in, for millennials “the Argentinian capital is actually the most expensive city on our list. The iPhone X is the culprit: it costs a whopping $2,244 here – almost twice what it costs elsewhere.” But the writers do point out that avocados here “are a bargain”. It seems that what young people lose on the devices, they may at least regain in healthy eating. The most expensive place for millennial essentials.